Simplicity permeates Apple from design and software all the way down to the purchasing experience. 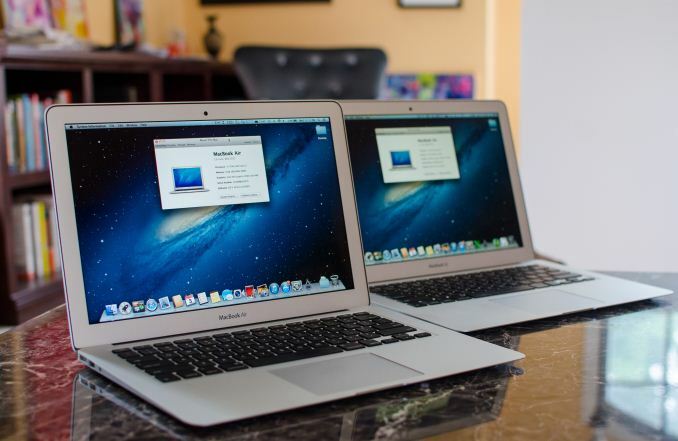 The 2013 MacBook Air offers only two choices of CPUs, and honestly for the vast majority of the population, that's all you really need. The default Core i5 1.3GHz (4250U) delivers the best overall battery life regardless of workload. Its performance is often somewhere in between a 2011 and 2012 MacBook Air depending on workload, although in some cases it's possible to see equivalent performance to an upgraded 2012 MBA. If you need more performance however, the 1.7GHz Core i7 upgrade (4650U) delivers. In most situations you get more than a 20% increase in performance, bringing the platform up to somewhere in between last year's 1.7GHz Core i5 and 2.0GHz Core i7 options. Once again, with the right workload you could even see performance as much as 20% better than a 2GHz Core i7 from last year. Although I didn't publish any results here, GPU performance seemed roughly unchanged compared to the Core i5 option. The tradeoff in battery life is pretty easy to understand. In mostly idle workloads, I wouldn't expect any real degradation in battery life compared to the Core i5. Both configurations are equally capable of hitting the same max battery life number. More active workloads however will likely show a 15 - 20% decrease in battery life when paired with the faster CPU. It's possible that you'll see a larger drop with a very aggressive CPU-bound usage model, but at that point I'd assume that you'll probably want to be plugged in regardless of what system you're using. In previous MacBook Airs, the choice of what CPU to buy was almost always a difficult one. Do you opt for the in-between upgrade or go all the way to the top? With this year's model, the decision is greatly simplified. If you want ultimate battery life regardless of usage model, stick with the base Core i5. If you need performance, the Core i7 upgrade is absolutely worth it. My personal choice would be for the Core i5, but that's because I tend to fall on the battery life side of of the battery life vs. performance fence when it comes to the MacBook Air. If the MacBook Air is going to be your only machine however, I can definitely make a case for opting for more performance.